The Annurian Empire's ruling family must be vigilant, as the conspiracy against them deepens. Having discovered her father's assassin, Adare flees the Dawn Palace in search of allies. But few trust her, until she seems marked by the people's goddess in an ordeal of flame. As Adare struggles to unite Annur, unrest breeds rival armies—then barbarian hordes threaten to invade. And unknown to Adare, her brother Valyn has fallen in with forces mustering at the empire's borders. The terrible choices they face could make war between them inevitable. Fighting his own battles is their brother Kaden, the rightful heir to the Unhewn Throne, who has infiltrated the Annurian capital with two strange companions. While imperial forces prepare to defend a far-distant front, Kaden's actions could save the empire, or destroy it. Attracting complaint and acclamation in almost equal measure, Brian Staveley's debut proved precisely as divisive as I imagined it might: there were those readers ready to invest in its incredible potential, and there were those bored by its borderline by-the-numbers nature. 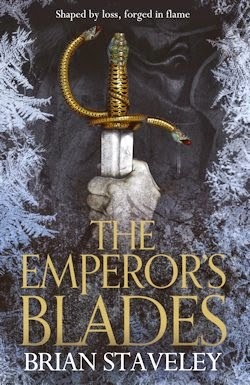 The Emperor's Blades undoubtedly did suffer from some significant issues—its manifest mistreatment of women in particular irked this critic—but at the same time, I found in the fantasy saga's first volume quite a lot to like. What little there was of its world was wonderful; the cosmic horror of its monsters was a welcome exception to certain unwritten traditions; meanwhile most, if not all of the narrative's central characters were well developed by the conclusion of what was an engrossing chronicle overall. At the end of the day, I dare say I enjoyed The Emperor's Blades. My reservations, however, came back to me in a flash when the time came to see about the sequel. By taking the better part of a hundred pages to begin, it doesn't put its best foot forward, I'm afraid... but beyond that? Boy oh boy. The Providence of Fire stands as a lesson in a sense: that great things can spring from small beginnings. The Providence of Fire picks up—when it picks up—right where The Emperor's Blades left off: with Kaden, heir to the entire Annurian empire since the assassination of his father, and Valyn, captain of a Wing of rebel Kettral riders—and his elder sibling's saviour—as brothers in both blood and arms at last. But the emperor-in-waiting's training has prepared him for the world in other ways. Seasons of study with the Shin have enabled Kaden to make use of the kenta: a network of ancient gates those who have attained absolute balance can use to travel from place to place instantaneously. In any case, having bid his brother goodbye, Valyn and his Wing—now traitors in the eyes of their trainers—are practically stranded in Vash, the hardscrabble lands North of the empire's territory. There, they learn that the once isolated barbarians who roamed these plains in the past appear to have joined forces under the command of a man—more or less—who means to bring Annur to its knees. 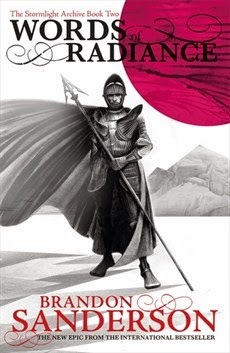 Annur—the seat of power of the aforementioned Malkeenians—is where we find Adare: a sister, a princess, and the unwitting lover of the man who had Emperor Sanlitun slaughtered—that's the regent Ran il Tornja, readers—yet without question the weakest of The Emperor's Blades' selection of perspectives. 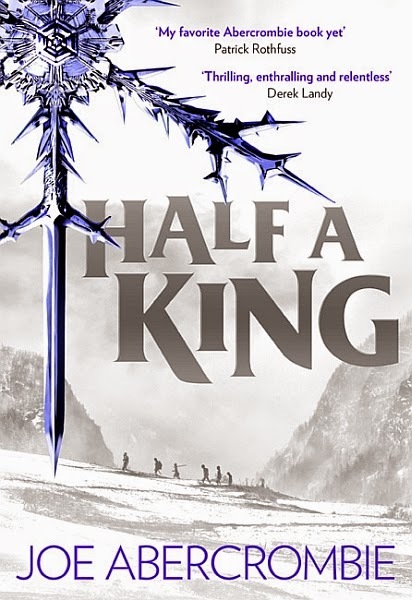 In the five of the fifty chapters she featured in, all she served to do, as I put it in my review, was "push the plot along and [...] have some hanky-panky," though that book's conclusion gave me reason to believe Adare would have more to do in book two. It's my pleasure to tell you: she does. Hers is, if anything, The Providence of Fire's predominant POV. Finally we find her at the centre of events, as opposed to the bedchambers beside said; from the first, in fact, Adare is an agent of change in Staveley's superior sequel rather than the royal bauble she was. Though she has a substantially more... substantial part to play in The Providence of Fire than she did in its problematic predecessor, Staveley's characterisation of Adare is still an issue. Initially, "her ignorance [is] infuriating," (p.103) and later on, I found myself frustrated by shades of The Emperor's Blades as she allows herself "to be led like a docile beast" (p.432) by the very man she sets out to unseat. If there's a weak link among the text's perspectives, however, it has to be Valyn's scattershot share of the gathering narrative. Staveley spent so long bringing him and his kin together in book one that it's kind of crushing to see the pair go their separate ways so soon. This rather robs our Wing commander of his role in the whole, so while Kaden's development continues apace, Valyn's simply stalls. As a way to embiggen the world he's wasted, but that isn't to say Staveley's determination to explode the story's scope goes unnoticed. On the contrary, The Providence of Fire feels markedly more epic precisely because of the author's efforts... I just wish this improvement hadn't cost us a central character. Like the exponentially more textured setting, then, The Providence of Fire is both bigger than The Emperor's Blades and leaps and bounds better. Staveley systematically addresses the most damning drawbacks of his debut, and if a couple of new problems appear in their place—aside the slow start and the pointlessness of Valyn's part, some key scenes are so rushed that their significance is as good as guaranteed to go unnoticed—I have renewed faith in him to fix them in the future. 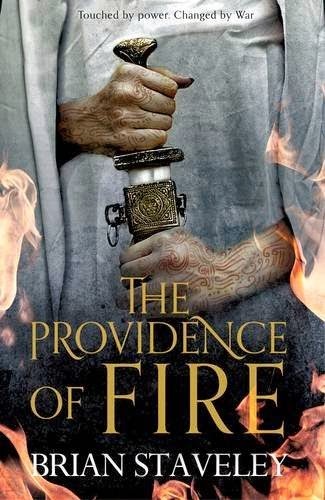 Brian Staveley mightn't be reinventing the wheel here—in that sense, and a number of others, the text is Sandersonesque—but The Providence of Fire is ultimately a ton of fun, and that's fine. Me, I'm a fan of fun. You want some? Mmm. That's a bit disappointing. It is. I was so pleased to see her take a more active part in the narrative, and then Staveley goes and takes that away from me! 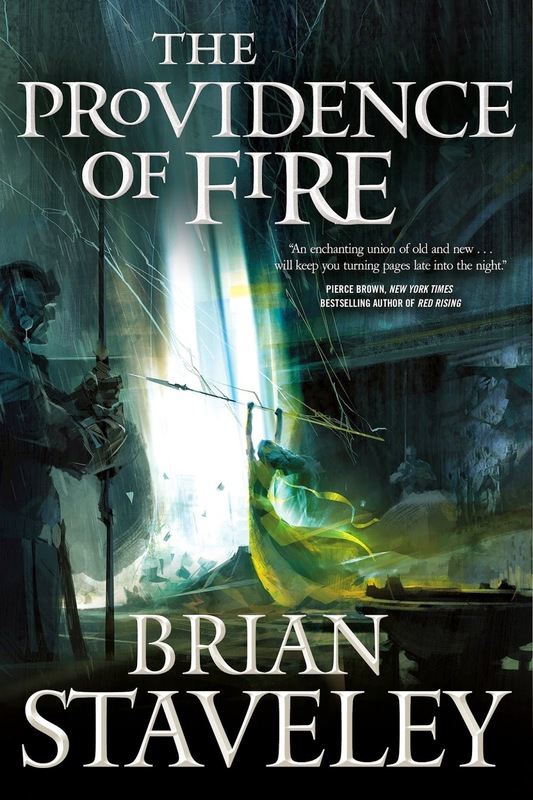 That said, this is a substantially better book on the whole than The Emperor's Blades, which I know a lot of folks loved in any event, so I expect The Providence of Fire will make some fantasy fans very happy.